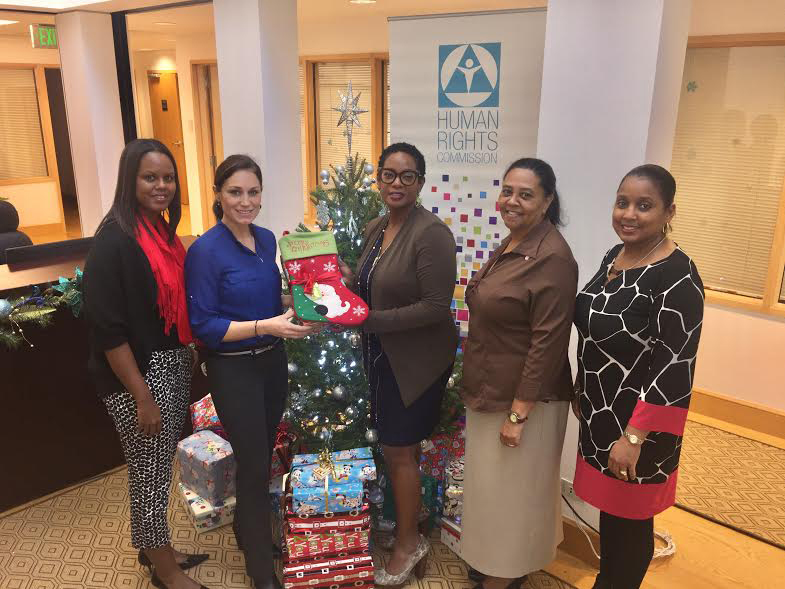 At the heart of the Christmas Season is the spirit of giving and with that in mind, the Human Rights Commission [HRC] donated twenty Christmas gift boxes to the Coalition for the Protection of Children [CPC]. CPC is a grass roots charitable organization, dedicated to meeting the needs of children and their families. CPC’s primary role is that of advocacy for families and children, and another significant role of CPC is to assist and empower parents to support their children whilst working to ensure the rights and needs of children in Bermuda are met. This is a first time initiative for the HRC staff and friends who filled the gift boxes for children in need. Each person was given an age and gender of 20 CPC clients, and the boxes were then filled with gifts for each child. “In Bermuda, and indeed all over the world the situation of children remains critical as a result of inadequate protections, and never is this felt more strongly or more evident during the holiday season,” said Tawana Tannock, Chairperson of the Bermuda Human Right Commission. “The Coalition for the Protection of Children, are one of the island’s charitable organizations that provide an invaluable service, advocating for protections and the rights of our children.